For the second day of my precalculus classes last week, I had planned to introduce them to some of the CAS syntax of their new TI-Nspire calculators. The following is my best attempt to recreate a conversation that happened when we explored the factor command. Of course, this could have happened on any CAS platform you have available (TI-Nspire CAS, Wolfram Alpha, Geogebra (v4.2 beta release and forum), …). I first asked them to factor . No surprises. Then, to demonstrate the power of the machines, I asked them to factor . The virtually instantaneous results elicited some “wow”s around the room. Knowing some sub-factoring would result, I suggested they factor . One student also factored . Announcing her result to the class, speculation immediately mounted that there might be a bigger pattern at play, especially for odd integer exponents. It’s difficult to use any toolbox to its fullest extent if you don’t know everything inside it. My only plan for this was to introduce a CAS command for problem solving later in the course, but my students had other plans. Seeing the results above, they started to make broader pattern predictions. Pattern 1: A few quickly surmised that for odd integer values of n, factored to . It was a nice stab at the obvious cases, so I asked whether the pattern also held for even values of n. Some reflexively said “no” based on the output, but others suggested that perhaps the non- factors of could multiply back together to continue the pattern the odd powers seem to follow. GREAT! I had planned to introduce the Nspire expand command, it’s need just developed organically. Why give a list of things for uninspired memorization when you can instead put them in situations where they’ll ask to be taught that same specific content? The students needed and asked for a tool they didn’t think they had yet. The results elicited a few more “wow”s and “cool”s. The pattern does seem to continue, but the CAS apparently seems to factor the non- polynomial factor further. What they didn’t ask was why the polynomials from even n factor further while those from odd n don’t seem to do the same. If the opportunity presents itself, I’ll circle back on that one another day. They also two other smaller connections. Boolean discovery: Notice the result from the last line of the last image. Rather than expanding product of the three binomial factors, one student compared what she suspected were the factors, and the CAS responded with the Boolean “true”. She had done this while the class was struggling to divine the name of the command that might make the CAS “un-factor”–before I gave them the expand command. It showed them that a CAS actually might be able to help evaluate student hypotheses. Continuation of Pattern 1: After seeing these results, I asked if the technology was required to factor . Most quickly replied “no” thinking, I guess, that was a special case they had memorized long ago. I pressed on. Does this fit the pattern we had just discovered? After a few silent moments more, one boy tentatively said, “Well, sure. If , then , using just the last two terms of the longer polynomials created for larger values of n. More “cool”s. 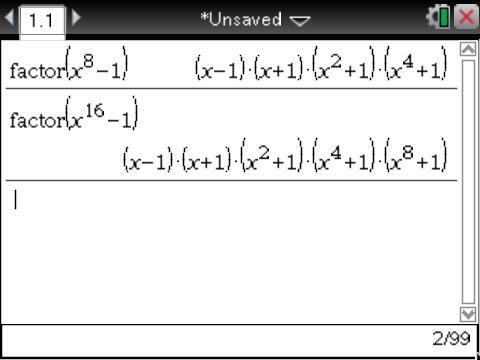 Final pattern: One other student noticed the cascading exponents in the factoring of . When asked why that was, he pointed out that could be written and factored as a difference of squares: . From there, the first term was also a difference of squares, and the pattern continued to the complete factoring of in line 3 of the first image. He confirmed his hypothesis with another “cascading” factoring of differences of squares with . 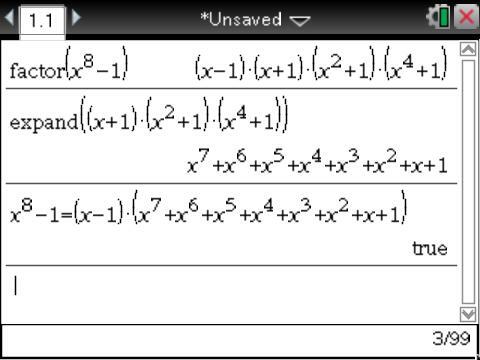 Conclusions: Obviously my students haven’t proved any of these factoring patterns yet, but I was particularly impressed with the way technology created an algebraic sandbox for my students. They were free to think and explore without me holding their hands every step of the way. 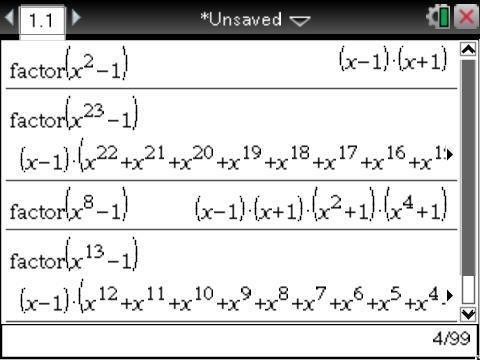 My students had “discovered” a cool factoring pattern. They had to THINK hard to describe what they saw and investigated to see if the pattern was universal or just some isolated occurrence. And technology clearly facilitated and enabled some high-level learning that otherwise would have been nothing more low-level and quickly forgotten memorizations. This happened last Thursday. Covering other ideas, I mostly left the idea alone Friday, but yesterday I asked my students at the start of class to factor without technology. They all nailed it. For the future? This was an accidental lesson, but it is one I’ll deliberately set up in the future for other classes. It was far more effective than any factoring worksheet I’ve ever seen. Here are some additional questions I plan to pose later if an opportunity arises. I’d love any ideas readers may suggest. If n is even, will the longer, non- polynomial always factor? Why? What happens for even values of n that aren’t also powers of 2? How can you PROVE that any of these patterns actually hold universally? Extension: One of the students stopped by my room after school Thursday to let me know that personal interest has led him to explore binary numbers in the past. He was intrigued by the connection of these results to decimal representations. Another great organic teaching moment! After a fun conversation with him, I decided to share with that class some thoughts I had on using your fingers to multiply. This is already long, so a description of that class will need to wait for another post.